06:11 PM – Amongst all this, the Twitter Contest is going strong. The 9th question just came up. 05:57 PM – “Malayaleegraphy is formed out of Malayalam + Graphics + Calligraphy”, says Orion while talking about the inception of the idea. 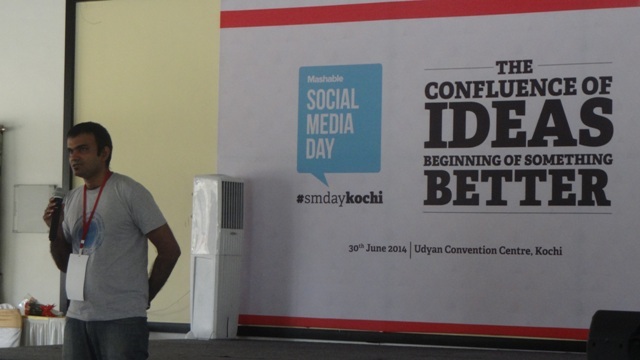 05:52 PM – Orion Champadiyil on stage sharing the success story of Malayaleegraphy. 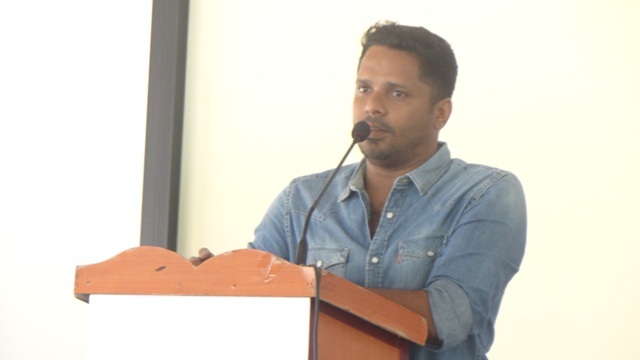 05:14 PM – Mr Chandramouli, Chairman of Maitri Advertising addressing the crowd and welcoming the dignitaries on the dias – Mr Kochouseph Chittilapilly, Tinu Cherian, Sandeep Verma, Occha Team, Christin Emmanuel George among others. 05:09 PM – Another 5 minute short break. Then return with the Award Ceremony. 05:04 PM – Jaseem plays the video to show how they have a fun work culture. This same video was later used in hiring new recruits. 04:56 PM – “If content is king, context is God”, Jaseem quotes Gary Vaynerchuck. 04:52 PM – “We started receiving some of our first orders via Facebook, all thanks to the “power of the people”. It was all on a Zero Marketing Budget“. 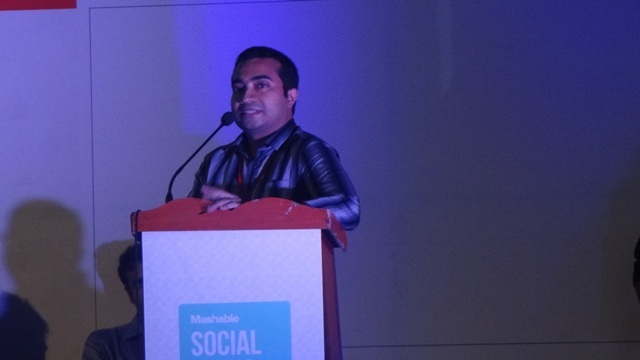 04:47 PM – Mr Jaseem TS, Co-Founder, Wowmakers, on stage now to share his success story of how Social Media helped his firm make headlines in the Industry. 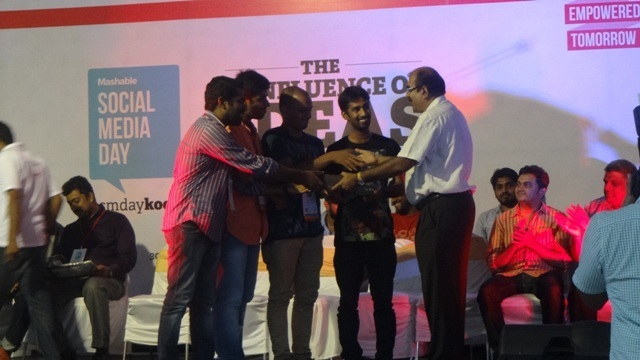 04:42 PM – Mr Kenny making the audience relate to the success stories of Blogging Methodology for Kerala Blog Express. 04:40 PM – V Guard Chairman, Mr Kochouseph Chittilapilly joins the audience here. 04:37 PM – All the behind the scene photos of Kerala Blog Express being shared by Kenny here. He sounds very enthusiastic while explaining the scenario of each image – from sleeping in a houseboat, to foreigners trying out lungi, to a Denmark lady seeing an elephant for the first time. Its all here! 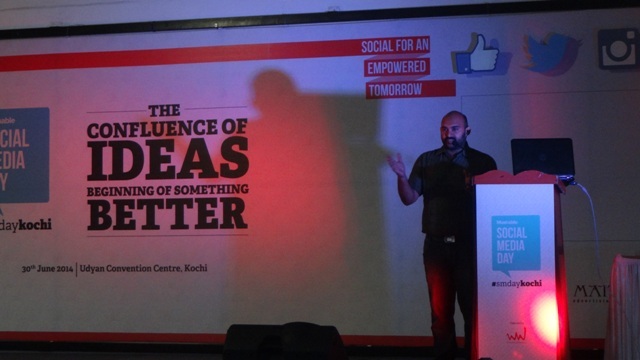 04:25 PM – Kenny Jacob on stage, sharing his views about Kerala Blog Express. 03:49 PM – “Any content on the net, makes most impact when it is adapted to suit local content”, says Ms Ann, iterating the point by Mr Hrishikesh. 03:42 PM – Ms Ann Mary George, CEO, Marunaadan Malayali, on stage, continuing with the same topic as Hrishikesh. 02:19 PM – Sessions about to start. 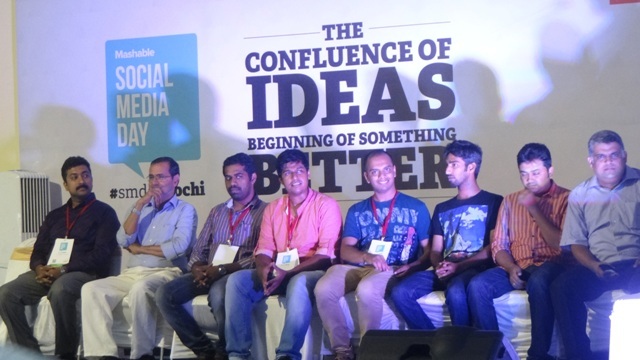 Organizers sharing their experience about why they decided to hold the event here in Kochi. 12:48 PM – Lot many SM Campaign videos being shown here. Mr Savio reiterates his point about the importance of being able to emotionally connect with the customer. 12:40 PM – Mr Savio now shows us the importance of connecting to the people by showing us the video of the Aircel Boat Campaign. 12:23 PM – “Multiple screens of entertainment have penetrated into our life.” 12:15 PM – Mr Dominic Savio shows us the following video of a Mobile App that was used in Tunisia to make people support their team. More details of the campaign can be read here. 11:59 AM – Now Playing on stage – Social Media Day video from Mashable. 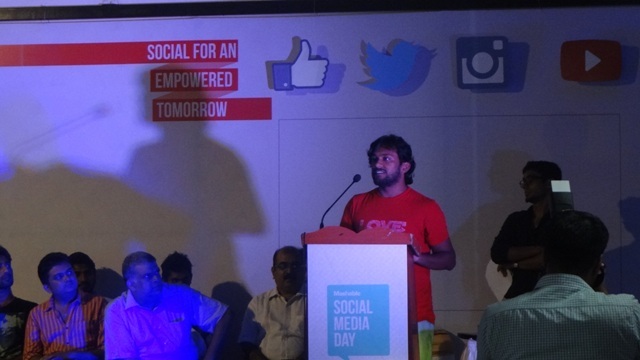 I, Aashiq Abu, hereby digitally inaugurate #smdaykochi. Its good to be social. 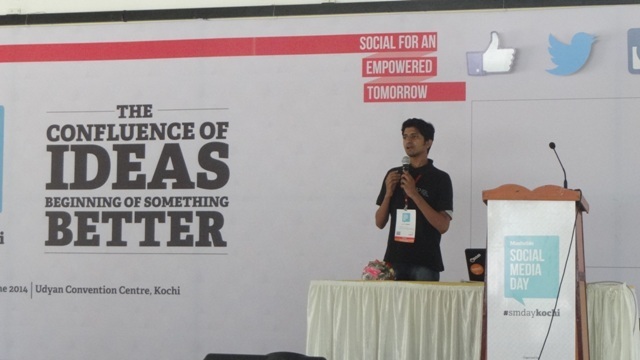 11:49 AM – Aashiq Abu on stage. Starting of in his trademark and classic Malayalam Style of rendering. 11:46 AM – Mr Dominic Savio, VP and Head of DD Mudra Group on stage. 11:45 AM – Aashiq Abu on stage. 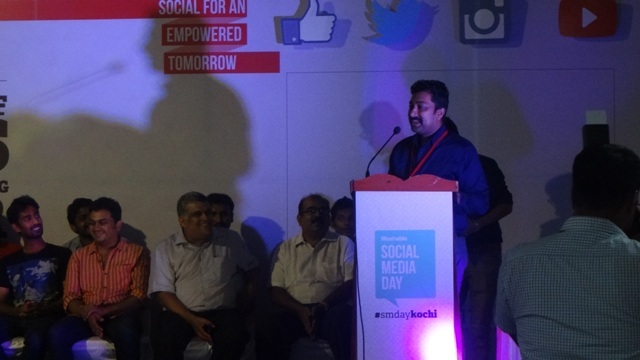 11:42 AM – Manoj Thomas (COO, Winning Wayz) on stage for the Welcome Address. 11:40 AM – Ready to take off. The MC’s on stage and the audience on Twitter. 11:30 AM – Audience taking up the seats. The ball’s about to roll! 11:28 AM – Aashiq Abu joins us as the Chief Guest. 11:15 AM – Media setting up their post.Cameras getting ready. Twitterati tweeting along! 10:45 AM – Registrations start. People are pouring in! Was about to scribble a few lines on the event when @deepaul shared this link. Well, I Couldn’t have said it any better.